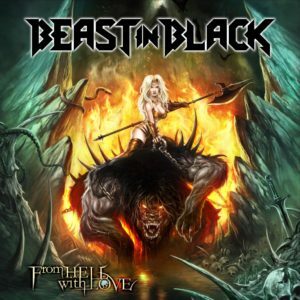 Only 15 months after the release of their highly-acclaimed debut album Berserker, up and coming metallers BEAST IN BLACK have finally unleashed their highly anticipated follow-up From Hell With Love, through Nuclear Blast Records – and musically the new record is in no way inferior to it! To celebrate, drummer Atte Palokangas has launched a drum play-through of the opening track, “Cry Out For A Hero”. Watch now! Order the album in various formats here. It was once again recorded in Anton‘s own Sound Request Studio, and true to the motto “Never change a winning team”, the cover artwork was created by Roman Ismailov who worked on Berserker as well as the first record Kabanen wrote under the banner of BATTLE BEAST, Steel (2012). From Hell With Love delivers everything that made fans love Anton‘s work in the first place. A slew of fast-paced tracks like the opener “Cry Out For A Hero” and “Repentless”, hymnic songs “Unlimited Sin” and “This Is War” and one of the band’s specialties, mid-tempo smashers that only BEAST IN BLACK can deliver are back and represented on the new disc by the lead single “Sweet True Lies” and the album’s title track. There’s one thing that all of these tracks have in common – each and every song catches the listener with irresistible melodies, taking residence in the listener’s mind from the moment they hear it. Tickets for the German shows.